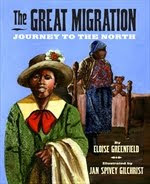 Featured Book: Greenfield, Eloise. 2011. The Great Migration: Journey to the North. Ill. by Jan Spivey Gilchrist. Amistad/HarperCollins. This new poetry picture book from NCTE Poetry Award winner, Eloise Greenfield, is a very personal work with a powerful, historic reach. She opens the book with a one-page narrative explaining the meaning of "the Great Migration," the mass movement of African Americans from the southern part of the U.S. to the North between 1915 and 1930. She situates her own family and her own "migration" in this context and the final poems weaves in details of her own family's story. Her frequent illustrator, Jan Spivey Gilchrist, has a similar story-- also noted-- and I wondered if some of the images of people (particularly their faces) were drawn from her or Greenfield's own family trees. Possibly! schools and homes and hope. spread the word. "Did you hear the news? to see. How about you?" Gilchrist's illustrations incorporate watercolor along with collage to blend scenes of landscape and personal portraits (often faces "lifted" from actual photographs), many set against a stark, black page. Thus, most of the poems appear in white text against a dark or black background for an even greater visual and symbolic impact. The combined effect of art that suggests real people along with a strong voice throughout the poem (often named) lends itself to reading aloud or dramatic performance. Greenfield provides a "Selected Bibliography" at the conclusion of her book listing other books about this subject that you may want to consult. Kids may want to conduct community interviews to investigate the experiences of "migrating" families in their area. Discuss the similarities and differences between "migrants" and "immigrants" then and now.